You are here: Home / Healthy and Happy / Is Your Pet at Risk for Lepto? Is Your Pet at Risk for Lepto? Leptospirosis is an infection caused by bacteria that is found in water or soil that contains urine infected with the Lepto bacteria. If your dog likes to play in the water, or if he drinks from puddles or ponds, he is at risk. The most common carriers of Leptospirosis are rodents, pigs, raccoons, cattle, fox, skunks and opossums. Dogs get Leptospirosis when they drink infected water, or when it get into their bodies through cuts. Leptospirosis is also zoonotic, which means that humans can catch it too. Symptoms. Some dogs that have a mild Leptospirosis infection will never develop any symptoms at all. The most severe cases tend to be in younger dogs, and include muscle pain, lethargy, loss of appetite, vomiting, and blood in urine. Serious cases can cause jaundice, so a yellowing of the eyes may be noticed. Advanced cases can lead to organ damage. Treatment. Dogs who present symptoms of Leptospirosis are usually treated with an antibiotic, although in severe cases, hospitalization is required. It’s important to be extremely careful with an infected dogs urine, in order to prevent spreading it to other animals – or to you and your family. Prevention. The best news is that there is a vaccine for Leptospirosis. 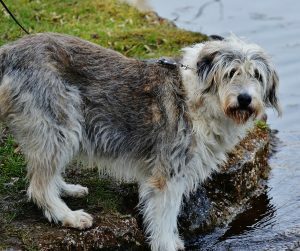 If you have a dog who loves water, we may recommend the Leptospirosis vaccine to protect the pets and the humans who live in your home. As always, if you have questions, talk to us at your dog’s next check up. We’ll talk about the risks, and come up with a vaccination schedule that is unique for your pet.